History: Skirt steak comes from the “plate” beef cut, which lies in between the brisket beef cut and the flank beef cut. 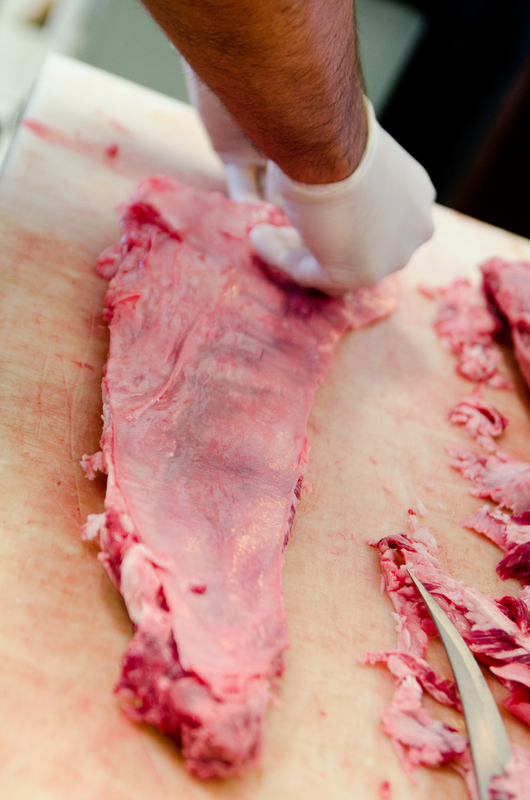 The belly of the beef cattle is comprised of the brisket, plate and flank cuts. Towards the front of the beef cattle is the brisket and the flank is near its behind. Some drawings/pictures omit the plate cut entirely and depict the beef cattle having just having the brisket and flank cuts; this is not the most accurate. What exactly is a “plate” cut? The only plate a non-veteran of the beef industry is familiar with is either the noun which describes the object we eat off of or the verb that describes how we place our food. Similarly, what is the skirt steak? It is actually the diaphragm of the cattle. You may or may not remember from biology class that the diaphragm acts as a divider between the thoracic/chest cavity (heart, lungs, ribs) and abdominal cavity (intestines, stomach, etc). Since the diaphragm acts as a divider, skirt steak is in encased in a tough, white lining; it’s best described as a membrane. The membrane is white in color, and translucent, almost opaque; it is also pretty think, just a few millimeters thick. First order of business is to remove this section. This is done by cutting off the edge to give you a place to grab onto the membrane. 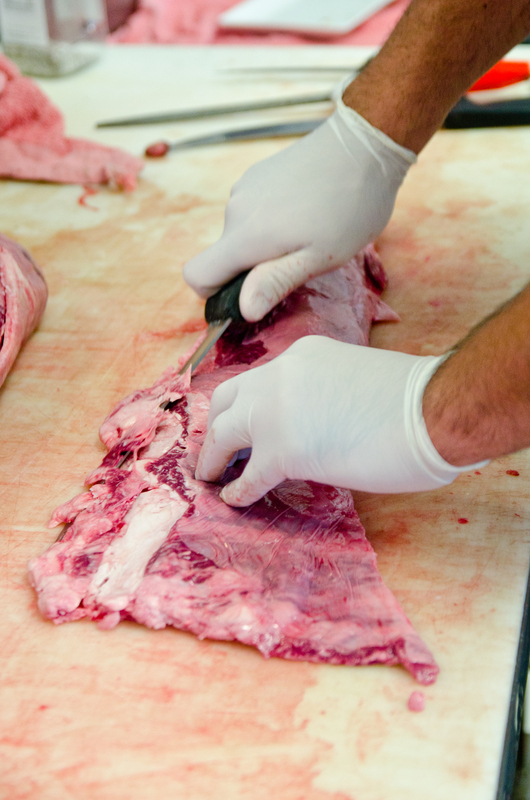 Next, the butcher grabs a hold of it and starts pulling with his dominant hand and holds down the skirt steak with the weaker hand. Notice how cohesive and tightly attached the membrane is to the meat. As you separate more membrane from the meat, the laws of physics makes the separation easier towards the end. The white membrane comes off clean, with no meat attached. 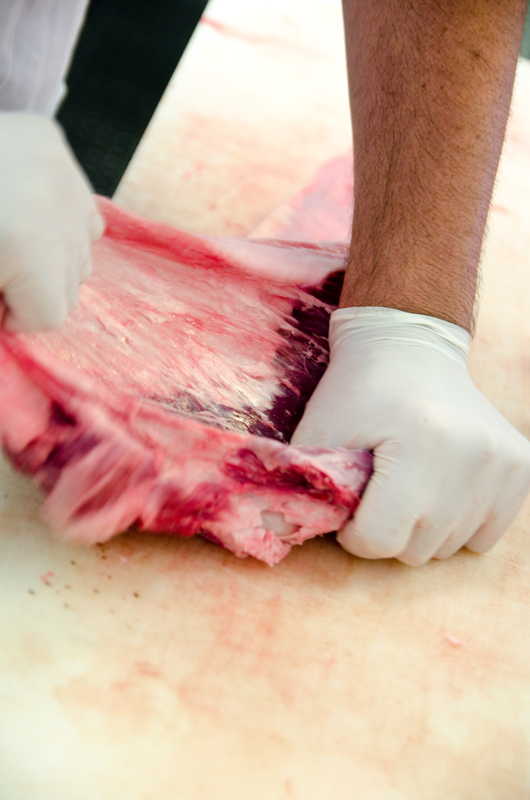 However, there is still strands of fat lodged within the meat that still needs to be removed. 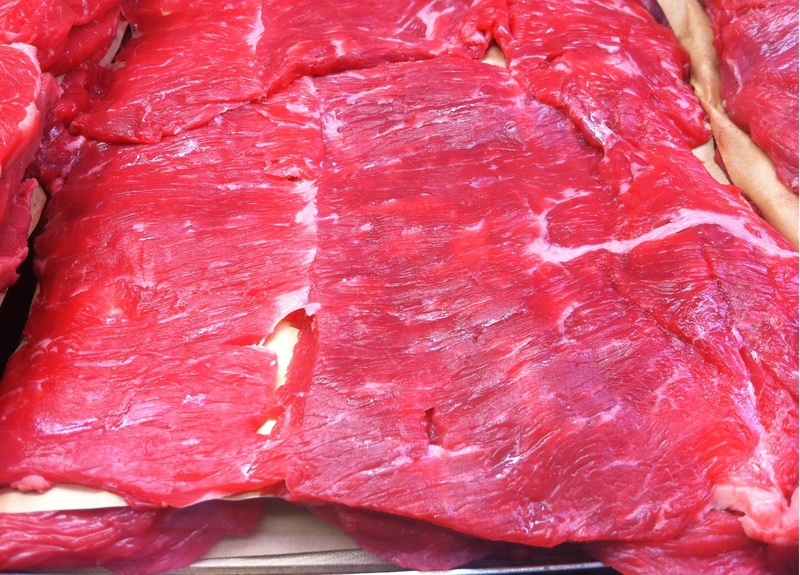 This is why skirt steak is seen as completely red and without fat at local grocery markets. There’s actually a lot of work that goes into producing what is seen in the display case at your local grocery. The essence of this cut is less about the texture and more about the flavor. Skirt steak is not tender compared to other cuts, but has a distinct taste to it. It is commonly used for fajitas. The state of Texas and certain TV shows have further segmented the skirt steak into two parts: the inner skirt and the outer skirt. Outer sells for higher. Narrow and thick is outer skirt, wide and thin is inner skirt. What you noticed in the first picture contains both the inner and outer skirt. Here, you will notice that this is the outer skirt steak. Have you eaten skirt steak before? How do you prepare skirt steak and how do you go about cooking it? Do share below and feel free to share any homey skirt steak recipes! cool post homey! i like skirt steak in fajitas!